“Do you think this is a new watering bucket?” . . . . The historic hen house has lots of unwanted critters, mostly mice. So many mice that placing traditional mouse traps to catch them would require daily loading and emptying traps beyond anybody’s patience (not to mention squeamishness to bug-eyed dead little critters). Placing mouse and rat poison is not an option. All the other devices we studied in the hardware store seemed completely inadequate to solve a serious mouse population in a 40′ x 16′ chicken house. 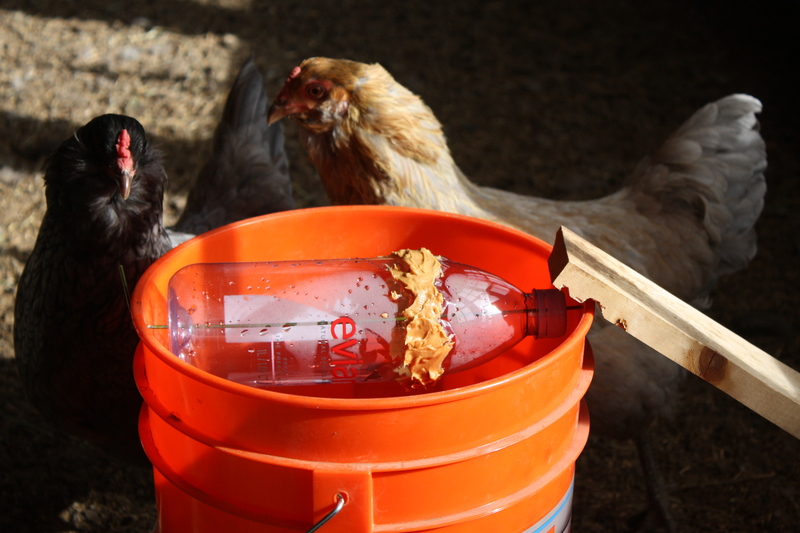 This five-gallon bucket filled 2/3 with water is a perfect dunk tank. All the mice have to do is walk the plank, taste the peanut butter spread on the bottle, which then turns on its axis dunking the mice in the water. Voila! This amazing invention was found on the Internet and is working very well. Our thanks to the inventor, whoever you are. Now if we can keep the girls from eating the peanut butter. We have also tried Nutella, just in case the mice have a preference.